Matt is owner of Cliff Outdoors, a family owned business located in Casper, Wyoming that designs and manufactures unique practical outdoor gear, including a number of innovative high-quality fly-fishing products. Matt loves to fish the smaller streams of central Wyoming and is also an avid hunter. 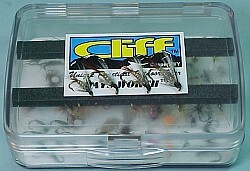 The Day's Worth box is manufactured by Matt's company, Cliff Outdoors. Winters can be long and harsh in Wyoming and I always look forward to the first "creek" fishing of the year. We are blessed with lots of great water in Wyoming. The North Platte goes right through town and fishes well all year long. As spring approaches it is time to think about small water and some of my favorite fishing of the year. I like to fish small remote streams. One of my favorites is basically a tiny spring creek (with a healthy population of wild brook and brown trout) that drains a large sagebrush basin in central Wyoming. The reason I hold this creek with such high regard is not because of the size of the trout (14 inches is big), it is because of the setting and the time of year I fish it. In late April or early May, (as soon as the one particular snowdrift is passable), you can get up into the high plains where this creek is located. You need a 4wd to get there and at that time of year no one else is around. Everything is in full Spring mode (sage grouse are strutting, wild flowers are out of control, and the big game hasn’t been bothered in months). It’s a great place. The creek is spring fed; however, there is a short runoff period when it nearly runs out off its banks and is off color. By late May you can fish dry flies, but the stream gets so low that the fishing gets tough (you spook one fish and every other fish for 100 yards knows about it). There is about a two week window when I like it best. Just after it peaks and starts to clear, it is time to break out my favorite small stream rod (a 6’6" 4wt)) and tie on the only fly you need, the "western-style" Blue Dun. My buddy King and I have fished this creek for years and a small muddler minnow (Herman is right, see his "smuddler") always produced. However, on one outing, King invited one of his friends (Dan Wolford) along to fish with us. On that trip, I watched Dan catch fish after fish. He would swing his fly across a riffle and strip it slowly upstream along the foam lined undercut banks. He just hammered the brookies. I had to find out what he was using, and he showed me what he called a "western-style" blue dun. He told me he had learned about the pattern in one of the books by Jack Dennis. 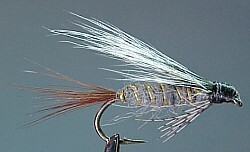 Jack had referred to this pattern as his dad’s favorite brook trout fly so he tied some up. He gave me one and the pattern has become a small stream favorite. Sure enough, brook trout like to eat it. It is a pretty simple pattern. However, what makes it fun to fish is that the white tips of the squirrel tail wing make it easy to see in the water (and see the fish eat it). Give it a try.